Carmen Winstead Story on Facebook - Is it True? Carmen Winstead Story on Facebook – Is it True? There’s a story circulating around Facebook. 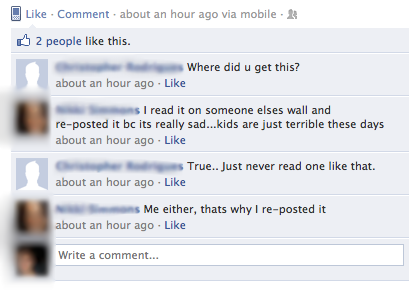 Great, another lame Facebook Spam / Chain status. I wrote a post about these types of status updates and refer to them as Facebook chain updates, because they’re very similar to those email chains we all used to get (some of you may still get them). Anyway, read this all the way to the bottom and please re-post this article on Facebook to any idiots posting these updates. Thank you. After lunch, her teacher announced that the school was holding a fire drill. When the alarm sounded, Carmen and the other students filed out of the classroom and assembled in the yard outside. As the teachers read out the roll call, the gang of five girls decided that this was a great opportunity to embarrass Carmen in front of the whole school during the fire drill. They moved over to where Carmen was standing, near a sewer drain, and began crowding the poorgirl, getting in her face and nudging her towards the open manhole. All of the other students began laughing. But when the teachers looked down the manhole and saw Carmen’s body lying at the bottom in the muck and the poop, the laughter abruptly stopped. Her head was twisted around at an odd angle and her face was covered in blood. Worse still, she wasn’t moving. There was nothing any of the teachers could do for her. Carmen was dead. When the police arrived and went down into the sewer, they determined that she had broken her neck. Her face had been torn off when she hit the ladder on the way down and her neck snapped when she landed on her head on the concrete at the bottom. The police hauled Carmen’s body out of the sewer and sent her to the mortuary. Everyone had to stay behind after school while the police questioned all of Carmen’s classmates. The five girlslied to the police, saying they had witnessed Carmen falling down the sewer. The police believed the girls and Carmen Winstead’s death was ruled an accident and the case was closed. Everyone thought that was the last they would hear of Carmen Winstead, but they were wrong. Months later, Carmen’s classmates began receiving strange e-mails on their MySpaces. The e-mails were titled “They Pushed Her” and claimed that Carmen hadn’t really fallen down the sewer, she had been pushed. The e-mails also warned that the guilty people should own up and take responsibility for their crime. If they didn’t there would be horrible consequences. Most people dismissed the e-mails as a hoax, but others were not so sure. A few days later, one of the girls who pushed Carmen down the sewer was at home taking a shower, when she heard a strange cackling laugh. It seemed to be coming from the drain. The girl started to freak out and ran out of the bathroom. That night, the girl said goodnight to her mom and went to sleep. Five hours later, her mom was awoken in the middle of the night, by a loudnoise that resounded throughout the house. She ran into her daughter’s room, only to find it empty. There was no trace of the girl. The worried mother called the police and when they arrived, they conducted a search of the area. Eventually, they discovered the girl’s grisly remains. Her corpse was lying in the sewer, covered in muck and poop. Her neck was broken and her face missing. It had been completely torn off. One by one, all of the girls who pushed Carmen that day were found dead. They had all been killed in exactly the same way and were all found at exactly the same spot. In the sewer at the bottom of the same uncovered manhole where Carmen had met her doom. But the killing didn’t stop there. More and more of Carmen’s former classmates were found dead. It seemed that anyone who didn’t believe that Carmen had been pushed, was eventually found down in the sewer with their necks broken and their faces torn off. They say that Carmen’s ghost is still on the rampage, hunting down anyone who doesn’t believe herstory. According to the legend, Carmen will get you, whetherit’s from a toilet, a shower, a sink or a drain. When you go to sleep, you’ll wake up in the sewer, in complete darkness, paralyzed, unable to move, hearing cackling laughter all around you. Then, as you scream in horror, Carmen will come and tear your face off. So be careful who you bully, because you just might find yourself on the receiving end of the curse of Carmen Winstead. FACT: About two months later, 16-year-old David Gregory read this post and didn’t repost it. When he went to take a shower, he heard laughter, started freaking out, and ran to his computer to repost it. He said goodnight to his mom and went to sleep, but five hours later, his mom woke up in the middle of the night from a loud noise and David was gone. A few hours later, the police found him in the sewer, with a broken neck and the skin on his face peeled off. Even Google her name – you’ll find this to be true. If you don’t repost this saying “They hurt her,” then Carmen will get you, either from a sewer, the toilet,or the shower.